The district unit of the All Assam Students Union (AASU) on Monday submitted a memorandum to the Assam Chief Minster through the Golaghat Deputy Commissioner demanding withdrawal of show-cause notices issued by the Inspector of Schools to three schools of the district. The principals of three schools namely Golaghat Government Bezbaruah Higher Secondary School, Kamarbandha Higher Secondary School and Kacharihat Girls’ Higher Secondary School have been served show-cause notices under the Rule 9 of the Assam Services (Disciplines and Appeals) Rules, 1964 read with Article 311 of the Constitution of India. In the show-cause notices, the principals have been charged with irregularity because on June 25, their students left their respective schools during school hours and such situation happened because they have “no control” over their students. 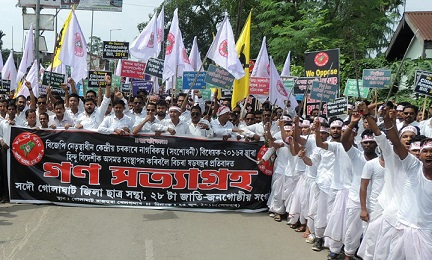 On June 25, the AASU took out a rally here against the Citizenship (Amendment) Bill, 2016 which saw participation from a large number of students. “We smell political conspiracy behind the show-cause notices because the copy of the show-cause notice has been given to Mrinal Saikia, the BJP legislator from Khumtai, whereas these schools did not fall within his constituency,” said Abhibartan Goswami, general secretary of the Golaghat unit of AASU. “Moreover, in independent India, students’ community of Assam has always been very active. They played active role in all the major issues originated since Independence. Whether it is oil refinery movement of 1955, the official language movement of 1960, medium of instruction movement of 1972, the Assam movement of 1979-85, the trend is still continuing. The BJP-led Government thorough their fascist acts, has been trying to oppress the voice of students and we will not let them succeed in their motive,” Goswami said. When contacted, Hiren Gogoi, Inspector of Schools, ruled out any political conspiracy or motive behind the issuance of the show-cause notices. “Whenever we found any irregularities or indiscipline in the working of teacher we issue show cause notice and it is a routine procedure. We have already received the reply to the show cause notices issued to the principal of three schools and we are going through it” Gogoi informed. It is to be noted that Mrinal Saikia is the chairman of the Act Implementation Committee of Assam Assembly. The committee on June 18 has taken a decision whereby restriction is being imposed on students of schools and colleges to stage any protest anymore during the school hours and warned the heads of institutions to face stringent actions as per the Service Rule if their students are found participating in any protest rally.